My third (and final) Postcards trip was split over two States, Oklahoma and the Inland Empire of California. John Steinbeck's novel The Grapes of Wrath had a profound effect on me when I first read it. Set in the 1930s, it tells the tale of the Joad family as they head west from the dustbowl of middle America to the promised land of Calfornia. Their journey formed the backbone of my own route through Oklahoma. I began in the Joad's hometown of Sallisaw, then stopped at other points where significant events happened in the book. Finally I reached Texola, a desolate, one-horse town on the Texan border. It should be noted that rather than trying to recreate or illustrate the novel I was primarily interested in how these places reflect the social and economic landscape of America today. Flying on to Los Angeles, I drove east to the Inland Empire, an enormous area of 270,000 square miles and home to some 4 million people. California is on the verge of its own dustbowl and this, combined with the fact that many people are heading ever deeper into the desert where land is cheaper but work is hard to find, is history being repeated in reverse. 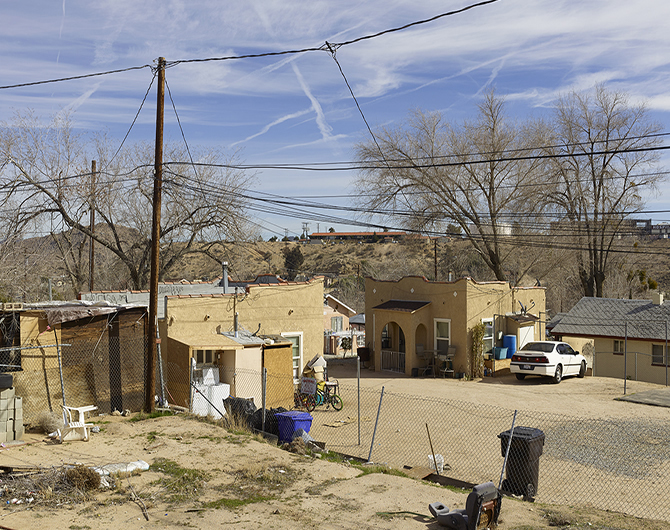 While in California, Alessandra Sanguinetti, Moises Saman and I shared a house in Riverside. The nearby metropolis of San Bernardino is currently second only to Detroit as the poorest city in the United States, declaring itself bankrupt in 2012. Here, in the Empire, I moved a little away from Steinbeck's novel (although they did visit Victorville and Barstow) but continued to be preoccupied with the movement and relocation of the population.